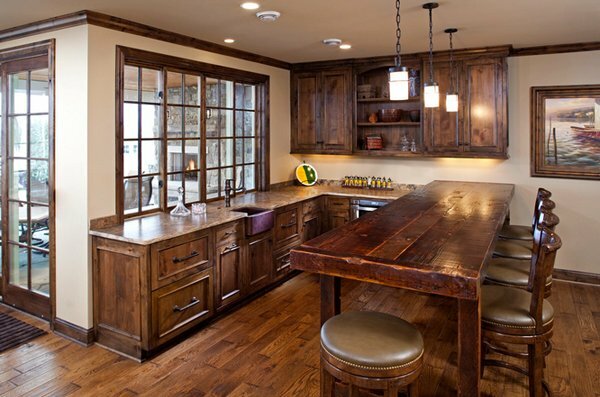 Distressed wood has been gaining popularity over the past few years. The technique used in creating distressed wood is not as difficult as it actually sound. This type of activity is something that even DIY fanatics can really do at their own home! The only thing that we need in doing such projects is patience and commitment to a well-organized plan. 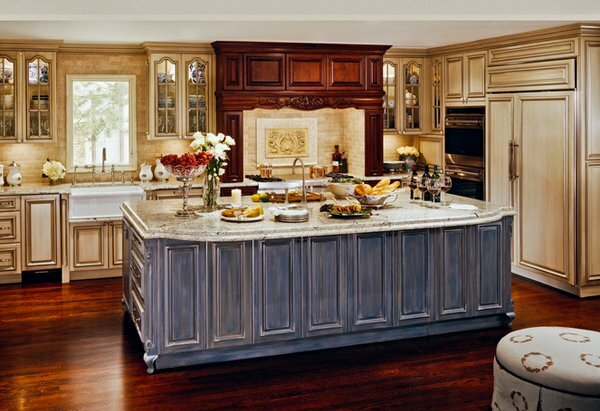 Plus, the aged look of distressed wood adds a modern elegance to any kitchen design. 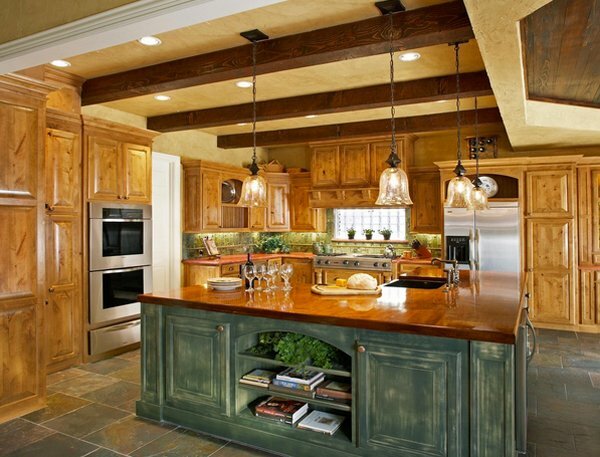 For today, we will be showing you 15 Perfectly Distressed Wood Kitchen Designs which will showcase a selection of colors that can be achieved for your kitchens too. 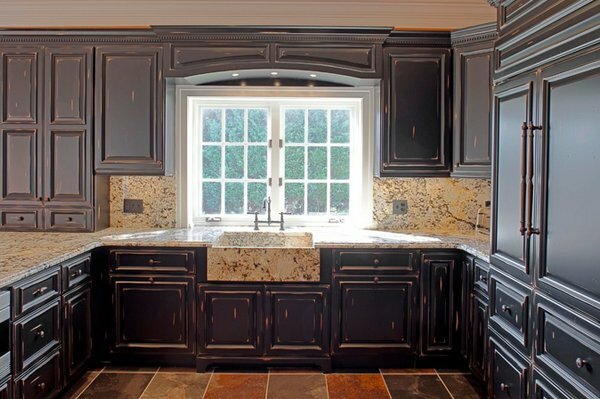 Just remember that the base color will only partially seep through the overcoat and if you want your distressed cabinets to match your kitchen motif, all you have to do is choose colors that will blend well with it. Before we go to all the color combos, check out the list we have below! This small space demanded attention to detail and smart solutions, starting with the table and chairs. Too tiny for a standard kitchen table, we added a table that folds down against the wall with foldable chairs that can be hung on the wall when not in use. 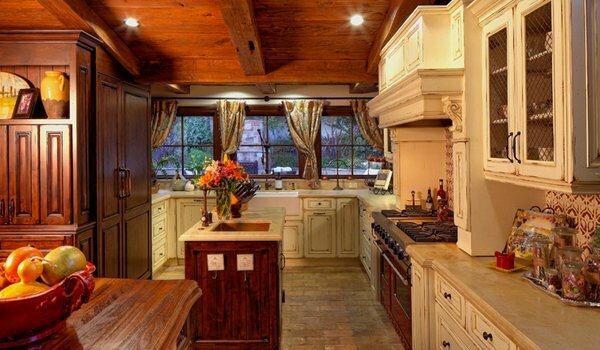 The mix of wood in this Mediterranean kitchen is kind of awesome. The brown and whites are great and the Arch Top Laterns above the island reminds us of another movie with witches or wizards. 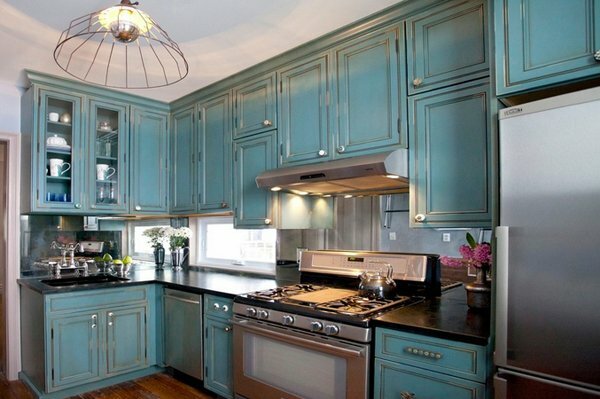 We have friends who said that if they were going to have dark cupboards, they said that they would go for this color. Dark but really catchy! Sarah Natsumi said that Campbell found the various reclaimed wood planks used on the kitchen island and beams at a local lumber mill. Instead of painting over it, she left the wood as is to show the character of each piece. The pristine 1960s barstools were a lucky garage sale find. The spiral staircase is from a WWII submarine. “I highly recommend spiral stairs as they are great space savers,” she says. 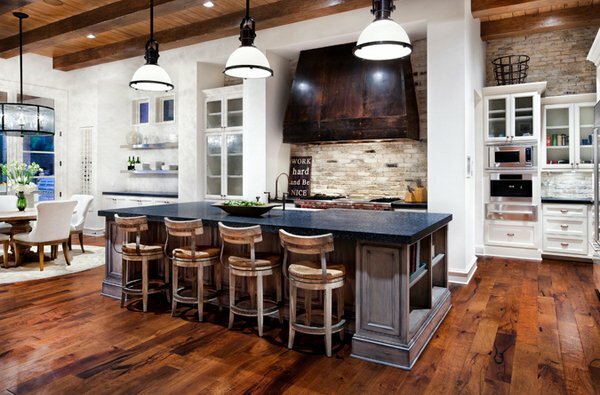 We like the feel of this kitchen – modern but warm – mix of stone, wood, brown, and grey and white. 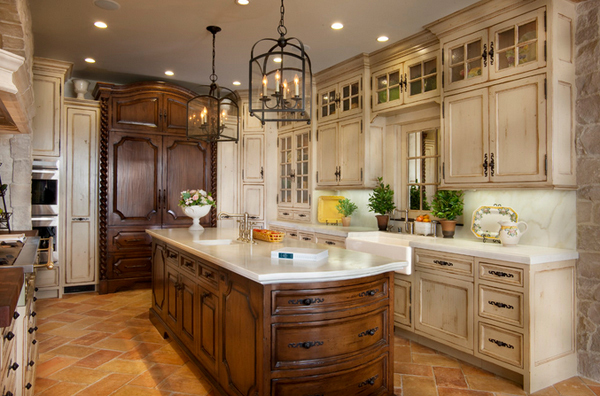 Pretty cool kitchen space. The color of the cabinets goes really well with the wood floor. It really does! 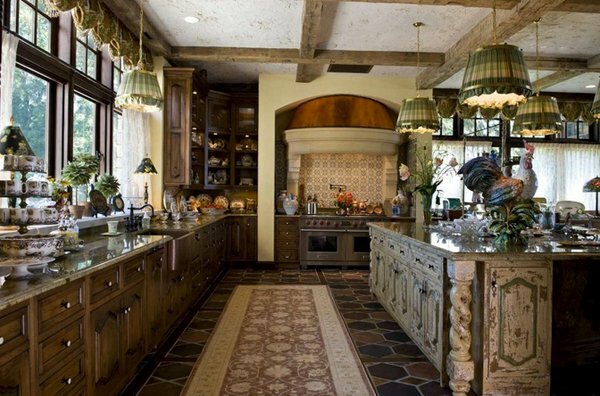 It feels so traditional and yet a bit rustic because of the tile work on the backsplash. By the way, we love all the pans above the island. In fairness, using the same color for everything in this kitchen seemed to have worked well. The rustic feel for this space is pretty awesome and looks great for one small space. 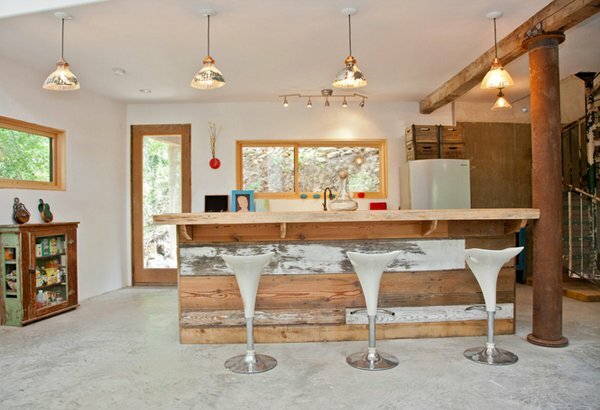 Doesn’t this kitchen space seems like cabin-ish? Well, it’s a good thing and the color palette for this space is really unique and homey. The backsplash could have been great if it matched the floors or complemented the cabinets, but of course, it still looks good. Don’t you just find the tile selection stunning? The finishes are super classic and we could actually sleep on the tiles if they were not cold! But all in all, we can definitely feed tons of people in this huge kitchen. 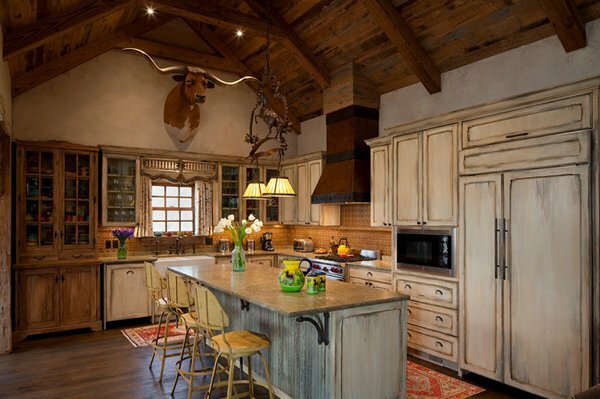 The most interesting part of this kitchen maybe the Longhorn above the kitchen sink. Some may freak out about animal heads, but this one looks really pretty and is one piece people will definitely talk about. Brown and beige looks good together. With the traditional Mediterranean farmhouse feel, we can say that the chicken wire in the cabinet on the right side, fits its place perfectly. 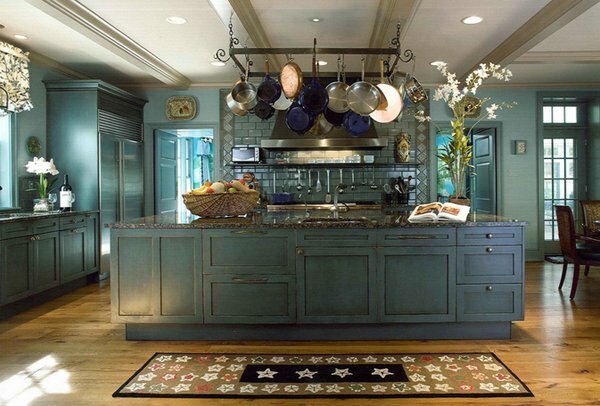 This is one stunning and collected traditional style kitchen with curly Maple countertops, a soapstone sink, hidden appliances, and aged primitive painted finish for all the wooden items in this kitchen. 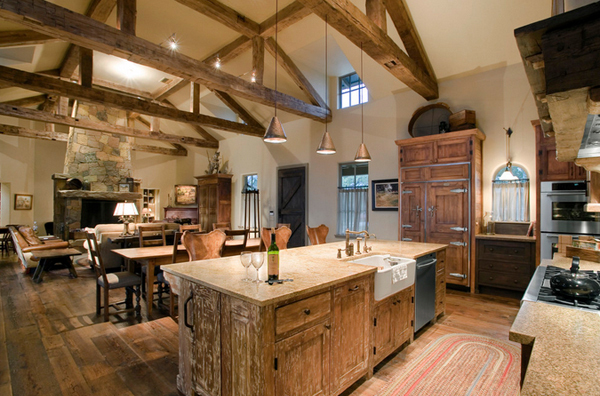 Look at the distressed kitchen island we have in this kitchen. The color is evidently different from all the cabinets but sure stands out! Jonathan L. Foote & Associates, Inc. 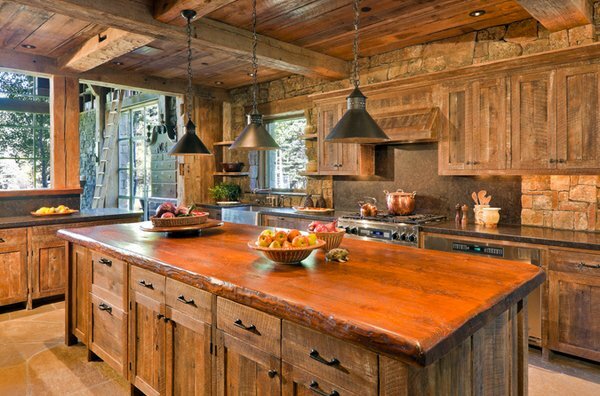 This rustic kitchen is super stunning. We love the saw marks left intact and the roughage sanded off to leave the saw marks. 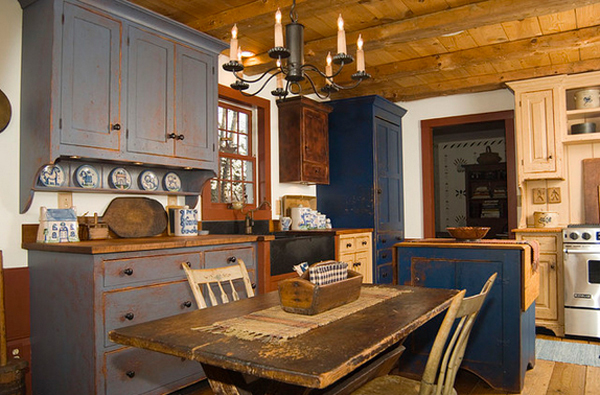 That list of 15 Perfectly Distressed Wood Kitchen Designs might have had your heads spinning! They were all pretty and would surely fit any style you want to achieve. At least most of the styles – like contemporary, modern, vintage, shabby chic and traditional! All you have to do is pick your favorite and do this little project that you can do with your friends or kids! Have fun! But before we let you go, check out rustic dining room designs which is pretty much related to getting distressed cabinets! Thanks for sharing those ideas.. I commonly seen this style in a rural place but it’s attractive.. Thank you for featuring this kind of design,our kitchen looks like this and I’m glad for it because I thought were out of the trend now a days. the Saltbox House is designed simply,,. Wood style but still they look luxurious.